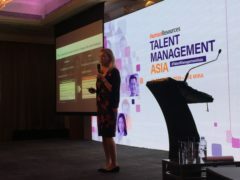 Into its fifth year, the two-day flagship conference Talent Management Asia 2019, Hong Kong, will evaluate the major trends set to redefine talent management in 2019 and beyond, including creating a good experience for potential candidates and employees, the changing face of HR leadership, transformation in talent management, and developing an adaptive culture and agile leaders. On day one, 21 industry leaders gathered at the Mira to engage in a lively discussion with our delegates. The conference was kicked off by Ross Sparkman, head of strategic workforce planning at Facebook, with a keynote on effective workforce planning for business success and Facebook’s optimal workforce strategy. Sparkman has more than 15 years of experience in HR management, people analytics and organisational development. He is considered an expert and thought leader in the fields of human capital strategy and strategic workforce planning. In his fourth year at Facebook, he continues to lead the people planning function that ensures the people side of the growth is aligned with the business side of the growth. 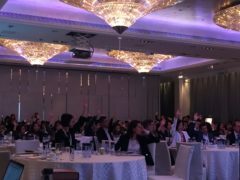 During his keynote speech, he warned that despite the arrival of a digitalised era for human resources, some HR practitioners are failing to stay updated with the new ways. 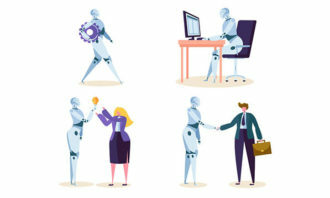 While technology is always changing faster than HR, companies need to adopt a proactive attitude and also help employees understand the latest changes. His keynote presentation was followed by a panel discussion on aligning the people side of growth with the business side of growth led by our magazine editor Robert Blain. Francis Mok, group director of human resources, Hutchison Port Holdings. Adrian Harley, executive director human resources, Swire Beverages. Kris Lui, human resources vice-president Asia Pacific, Vertiv. They dived into the expectations from the board of management, sustainable developments and organisation development. After a short break, Kelly Cheung, marketing manager at Macao Government Tourism Office, shared how a rewarding incentive trip for your talent could benefit the workforce, followed by a case study by Laura Stephenson, consulting director at PwC; and Bing Wang, principal solutions consultant at Workday. They discussed how to utilise technology to engage talent. It should be, ‘When are they going to leave’?” Stephenson said. 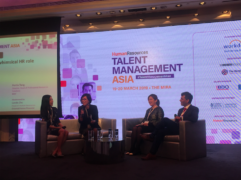 The morning ended with a panel discussion on reimagining the whimsical HR role, led by Carole Zhu, head of human resources at Oriental Patron Financial. Carrie Tse, vice-president, human resources, Asia Pacific, KKR Asia. 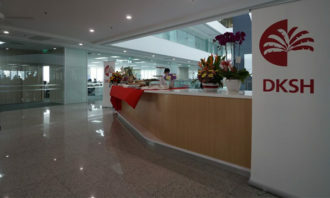 Portia Tang, director, head of professional resources solutions, BDO. Arpan Khurana, vice-president, talent acquisition, Moody’s Corporation. Four industry experts shared the evolution of the role of human resources – from an administrative and operational role to a strategic business partner; rebranding of job titles such as “chief laughter officer”; the traits of the most interesting HR roles; and major HR trends. 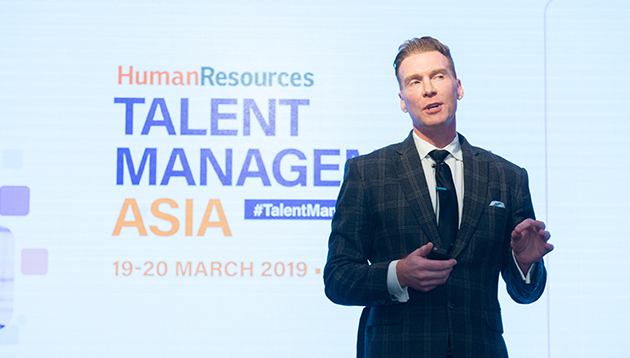 After lunch, delegates were welcomed back with a panel discussion between Sparkman and Steven Young, head, chief administration officer, Asia HR and head of HR analytics, regions, at HSBC, moderated by Susan Prayana, regional manager of HR data and efficiency at AXA. Sparkman and Young introduced their practices on data analytics, questions HR practitioners should ask on application, and explored who should have access to the analytics function, and how they extended the analytics function to a broader function. Sparkman reinforced that owning quality data lays a strong foundation for a company’s credibility and competency. Graham Barkus, managing partner at The Human Factor, on building an agile business environment and company culture. 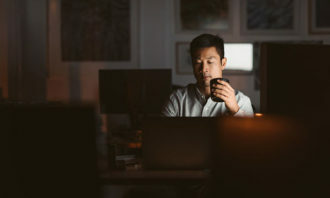 M Moser Associates’ director and associate director of workplace strategy, Lawrence Lok and Nancy Liu, discussed the imperatives for the transformation of the workplace and ways to foster greater satisfaction and wellbeing. The topic of the last panel discussion of the day was high-impact talent management and the strategies for diversity and inclusion. Moderator: Natalie Ackerman, EVP, Greater China, head of diversity, equity and inclusion, Jack Morton Worldwide. Varshaa Ram Kutik, APAC head of diversity and inclusion, Bank of America Merrill Lynch. Jack Guest, diversity and inclusion lead, retail banking and weather management, Asia Pacific, HSBC. Annabelle Baker, director, LUSH Asia. They discussed how companies could approach diversity and inclusion policies through both top-down or bottom-up management, their take on quotas and targets, and tips on implementation and measurement. 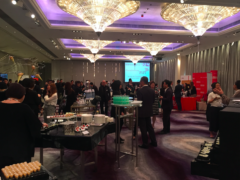 The day ended with Ben Chan, head of talent development at Sun Hung Kai Properties, on the identities of talent leaders, three tips on becoming a strategic talent leader and how the company developed its talent. Editor Wong Yat Hei explains why working in big-name companies is not necessarily the recipe for success. ..
A whopping 76% of CIOs in the region are worried a technology skills shortage will have a devastating impact on the business. ..
More regional remits for HR directors in the nation, and per annum salaries of up to S$400k for HR generalists - here are the deta..